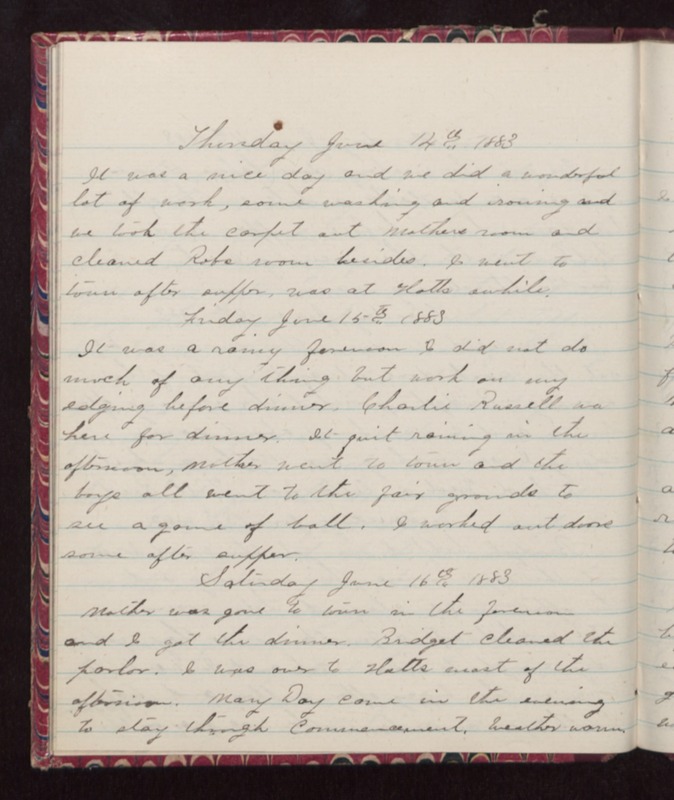 Thursday June 14th 1883 It was a nice day and we did a wonderful lot of work, some washing and ironing and we took the carpet out Mothers room and cleaned Robs room besides. I went to town after supper, was at Hatts awhile. Friday June 15th 1883 It was a rainy forenoon I did not do much of any thing but work on my edging before dinner. Charlie Russell was here for dinner. It quit raining in the afternoon, Mother went to town and the boys all went to the fair grounds to see a game of ball. I worked and doors some after supper. Saturday June 16th 1883 Mother was gone to town in the forenoon and I got the dinner. Bridget cleaned the parlor. I was over to Hatts most of the afternoon. Mary Day came in the evening to stay through Commencement. Weather warm.